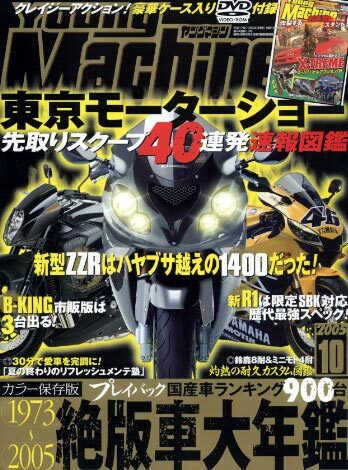 2006 Kawasaki ZZR1400, 2006 Yamaha R1 and release of 2006 Suzuki B-KING GS1400R! Thanks to Robert Monroe for the heads up info. Is that supposed to be a bike to compete with the hayabusa for the title of "fastest production bike?" Good question. I'm not sure. Kawasaki is known for making some of the fastest mass produced japanese motorcycles. They once were "king" of the sportbikes, but I think it's fair to say Suzuki took the crown, but it's a hard crown to keep. If Kawasaki wants it back, the ZZR1400 may just be a winning ticket. 1000cc, 1100cc, 1200cc, 1300cc and now 1400cc!?! When will it end, I guess it will never end. Go faster, faster, faster! keysman wrote: 1000cc, 1100cc, 1200cc, 1300cc and now 1400cc!?! When will it end, I guess it will never end. Go faster, faster, faster! I'm sure that 2300cc Triumph Rocket III motor will seem tame compared to the new crop of 1.5 liter sportbikes.